Friday, April 19 Owner operated. Results Guaranteed! Serving Annandale since 2002. Commercial and Residential. air starting to smell stale? Each day we pull pounds and	pounds of clayish gritty soil out	of the base of your neighbors’ carpets. It is in yours too! Spread	the yarns apart and look deep. It’s	grinding your expensive	yarns into worthless	fibers that fill up	your vacuum bag. This is the #1	cause of wear. Every moment you wait, your carpet wears out faster. pollutants that make their way	inside your home, settle into the	carpet yarns. Slightly sticky, they	grab dirt and lock it on. Through	a process called 'oxidation’	soils bond with the carpet,	causing color change, and	becoming permanently	attached. The longer you wait between each carpet cleaning, the more soil becomes permanent. Like a giant filter, your carpet	traps pollutants so you don‘t	breathe them over and over. But	what happens when that “filter”	gets full? 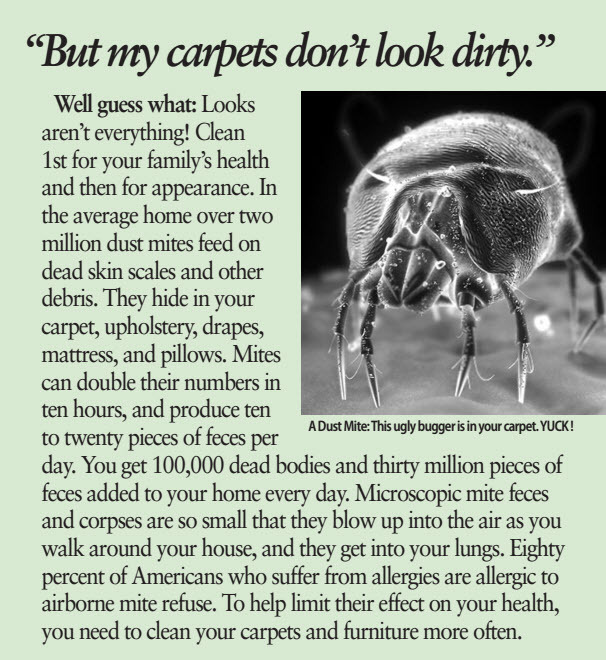 Your family starts breathing dust mite debris, pollens,	pollutants, fungus, spores, bacteria	and a long list of other really gross	stuff. Once your carpets natural	filtering ability gets full, it is time	for a thorough cleaning for your family’s health’s sake. Clean every six months and you will breathe easier. Most Thorough Cleaning Ever or it's FREE. We back every job that we do for you with our ironclad, no hassles, no regrets 100% money back guarantee. Long Lasting Deep Clean. We clean 100% of your carpets yarns, not just buffing the surface. Your carpets will stay cleaner longer because we extract all the dirt. We restore your dingy and dull carpet to fluffy and soft carpet without chemical or soap residues. Honest Pricing. No sales gimmicks, no hidden costs. All prices are quoted up front, in writing with no hidden charges. We do not differentiate between normal cleaning and "special" cleaning. Our service ALWAYS includes the best techniques and efforts to get your carpet as clean as possible. We are dedicated to YOU! We are dedicated to our clients before, during and after every cleaning we do. We understand the value of a lifetime client. We always pre-sprays all carpeted areas before hot water extraction. We use a product called FLEX, a concentrated enzyme pre-spray specifically designed for use on restaurant and kitchen carpeting and is particularly effective on heavily soiled traffic areas, greasy protein stains, body oil stains on upholstery, food residues, milk, grass stains and blood.